Leah Patricio sings Celine Dion’s ‘Because You Love Me’. The Voice of the Philippines Season 2 continues to reduce the number of contenders to Top 8 on February 15, 2015. Aiming to continue in the race to be The Voice, Team Lea’s Timmy Pavino, Nino Alejandro, and Leah Patricio performed their hearts out. Leah Patricio shared that she met her husband during one of her gigs. She said that it is her husband who does a lot of the house chores. He does everything for her and he supports her in every way to reach her dreams. He quit his job to help her care for her father and take care of the family. Apl said that he loves everything in her performance. Lea Salonga had been speechless at first. There was no word to describe her performance which seemed to be from angels. 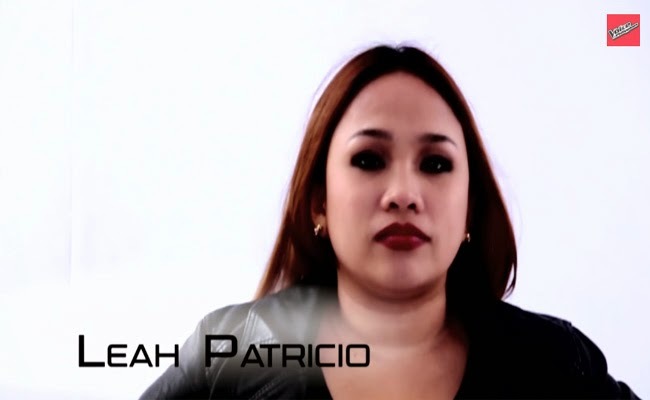 Leah Patricio is the first artist in Team Lea to get in to Top 12 from Coach Lea. Leah Patricio was followed by Timmy Pavino while Nino Alejandro was saved by their coach. The voting lines are only opened for 5 minutes during the commercial break right after the three finished their performances. The results had been revealed before the show ends and the Top 8 will finally be decided. Who will stay to perform in semi finals and who would have to let go?